“Restore and manage forested landscapes at a pace and scale that reduces the risk of uncharacteristic wildfires and increases the health and resilience of forest and aquatic ecosystems in a changing climate for rural communities and the people of Washington state”. At the direction of Senate Bill 5546, DNR’s new forest health strategic plan includes an assessment of lands for which DNR is responsible for fire protection, as well as lands outside the Department’s fire mandate but which pose a high risk to other areas. Unhealthy and fire-prone forests exist across ownership, as seen when private industrial timberlands have burned in recent fires. This mandate makes DNR’s plan impactful across land ownership and management boundaries—presenting a significant opportunity for the landscape-scale restoration required to solve our state’s fire and forest health predicament. 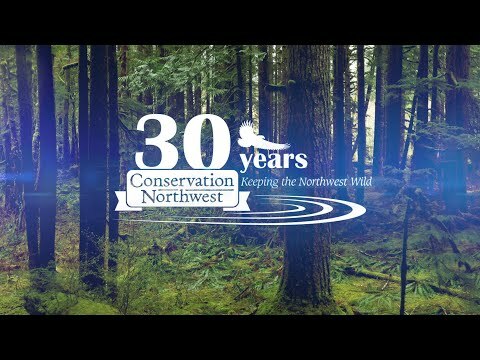 Conservation Northwest has long advocated for science-based forest restoration on state and federal lands to restore forest health, improve wildlife habitat, and better protect communities from fire. “We’re glad to see DNR beginning a new 20-Year Forest Health Plan, and we look forward to working closely with the state, forestry businesses, and conservation leaders to help guide the implementation of this plan. Conservation Northwest’s Science and Conservation Director Dave Werntz will formally advise work done under this plan as a representative on DNR’s citizen advisory committee. We expect these efforts to be conducted in a scientifically-sound way that benefits forest health, wildlife, and communities. Healthy, resilient forests mean less risk of wildfires spreading into areas with homes and cabins. They also provide better wildlife habitat, and increased opportunities for wildlife watching, hunting, fishing and outdoor recreation. We strongly support efforts to restore healthy forests that can better handle fire, while at the same time improving degraded streams and fish and wildlife habitat. We currently collaborate with a range of agencies and stakeholders on a number of such projects in north-central Washington, and we hope to work with DNR on similar forest restoration efforts in the future. Fire is natural and inevitable in dry forests like those in Eastern Washington. But lately, fire has burned in less-natural scale and intensity due to the effects of past logging practices and decades of fire suppression. By restoring more natural conditions through thinning and controlled fire, we can reduce threats to communities and wildlife habitat. Coupled with Firewise building tactics, these efforts will better protect communities and provide future benefits including making our forests more resilient to climate change and enjoyable for outdoor recreation. There are abundant examples of fires burning in heavily logged areas. Logging alone won’t protect communities, prevent large wildfires, or restore forest health. However, restoration logging is an essential part of work to create healthier forests and habitat while providing jobs and wood products. The state’s goal of restoring 1.25 million acres is ambitious, but we can reach it by thinning and prescribed burning the right places and using fire alone, both controlled burns and monitored wildfire, as a tool for many other acres.